Saturday 17th and Sunday 18th of August, at 2pm – 6pm each day. Join NES artists Judy Thomas and Charlotte Keniston in a two-day workshop exploring Skagaströnd through pinhole photography and audio recording. Taktu þátt í tveggja daga vinnustofu, með Nes listamönnunum, Judy Thomas og Charlotte Keniston, við að upplifa Skagaströnd gegnum nálarauga myndavélarinnar og hljóðupptökur. Fyrri daginn býrðu til þína eigin myndavél, framkallar myndir og þróar þannig þínar hugmyndir. Seinni daginn tekur þú upp hljóð úr umhverfinu. Við vinnum síðan saman að því að samþætta myndir og hljóð í listrænan búning. Vinnustofan verður laugardaginn 17. og sunnudaginn 18. ágúst nk., kl. 14.00-18.00. Vinnustofan er ókeypis og fólk á öllum aldri velkomið. Alls geta tíu manns tekið þátt. Skráning á netfangið cskeniston@gmail.com. During day one of the workshop you will make your own camera, and using a darkroom, develop your own image. When you return on day two, you will learn to use professional audio equipment to explore the sounds that surround us. We will then work together to combine these elements in a final artwork. The workshop will take place on Saturday 17, August and Sunday 18 August from 2-6pm. The workshop is free and all ages are welcome! 10 places available. Please email cskeniston@gmail.com to reserve your spot. 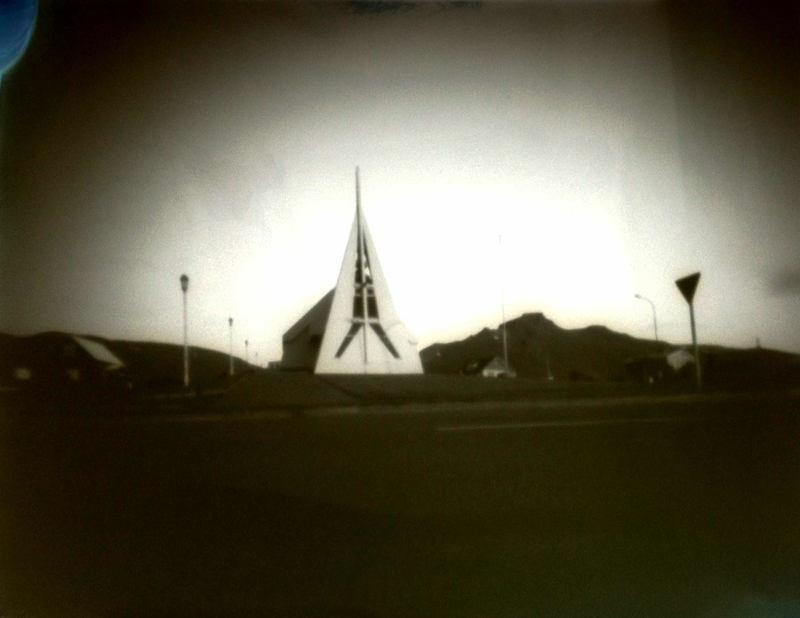 Pinhole photograph by Jude Thomas and Charlotte Keniston.